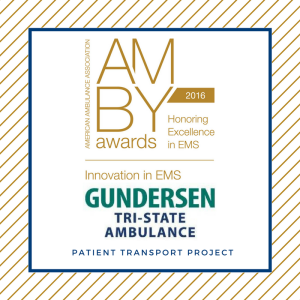 AMBY Award Winner – Tri-State Ambulance provides high-performance emergency medical services to Wisconsin, Minnesota, and Iowa. Ambulance services which provide 911 coverage frequently have patients who request service but ultimately fail to accept transportation to a hospital for further care. Depending on the service area, non-transports can be 30% or more of all requests for service. These ambulance responses can range from falls or diabetic issues, to motor vehicle crashes and anything in between. It is known that transporting a patient to an emergency department is not always the most appropriate choice for their medical care. Often, a visit or a conversation with their primary care or specialty provider may be a better option. Due to HIPAA regulations and continuity of care rules, the patient response information, when they are not transported, does not proceed further than a typical quality assurance or billing department review. This ultimately leaves the patient’s primary care provider or other specialty care provider completely unaware that their patient was cared for by another medical professional in an urgent setting. Upon investigation we found that the general public was unaware that their information from the contact with an ambulance service was not being sent to their current providers. In an electronic world, the general assumption by most patients was that all medical situations would be collected in one comprehensive medical record and not separated by service providers. This situation was noticed by a new billing manager who was often the last person to look at a patient’s medical record. It was quickly realized that other health care professionals should be aware of patients who are cared for by an ambulance crew and not transported. Although there have been tremendous strides made in the Community Paramedic (CP) or Mobile Integrated Health (MIH) programs, the industry is still far from global reimbursement and universal standards. The hope for this project was to establish essential communication that was missing between a patient’s medical provider and the documented ambulance visit. Through this communication, providers may proactively set an appointment with the patient which could help prevent an emergency room visit or ultimate admission and therefore reduce the potential patients that would be subject to a CP or MIH program. As with most aspects of healthcare, it is proven that early intervention has the best long term results and often at a significant cost savings to the system and patient. The best systems would utilize a multifaceted approach that uses early intervention and post care follow up. The goal of the project was to make available the patient care report from an encounter with an ambulance crew, when not transported, to their permanent medical record of their primary and/or specialty care provider. Secondly, it was intended for a provider to deliver proper follow up care and ultimately improve patient outcomes or experiences. It was thought that patients who receive the proper follow up care are less likely to call for an ambulance again for the same issue, thus reducing repetitive patients. It was also considered that improved follow-up would reduce the potential for the patient to develop more serious medical situations in the future. The project was first implemented in Q4 of 2013 with some major changes since inception. The basic practice of sending patient medical records to the medical provider of the patient’s choice was implemented and worked smoothly from the start. The process involves an ambulance crew obtaining two signatures from a patient when transport was refused. The first signature is the acknowledgement of the refusal of transport and the second is the voluntary request to disclose their medical record to the provider of their choice. The release of information disclosure is strictly voluntary and complies with HIPAA regulations. After implementation, it was noticed that the process didn’t seem to have a quantifiable way to track improvement in patient results or outcomes. On January 1st of 2015, the new process was executed with two local health systems that routes the patient record directly to a quality assurance nurse for review. Both of these local health systems incorporate large medical clinics which provide medical services to the vast majority of the local population. The nurse would then contact the patient to see how they are doing since the encounter with the ambulance crew and to schedule appointments with their providers if needed. The nurse was also able to see if the patient had come in to urgent care or the emergency department after they refused transport or to see if they have any pending appointments. Dependent on the nurse findings from the telephone call, they had the ability to contact a patient to change an appointment to an earlier date or to see if there are any other services that they can refer to the patient. The initial impact has proven to be very successful. The first positive impact was with our paramedics and EMTs and their response to the new process. Sending the ePCR to the patient’s medical provider allowed the employees to know that the patient was going to get further care or follow up that they needed. 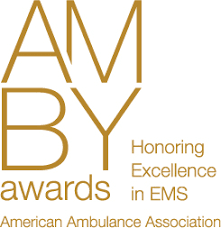 This has enabled the field EMS provider to still feel a sense of completion and satisfaction because they are providing the catalyst for further care. Also, when these patients receive a follow up call or physician visit they are less likely to become a high utilizer, as shown by preliminary data. Reducing unnecessary calls for repetitive patients has also improved employee morale. Further research is being conducted to evaluate the percentage of improvement from the reduction of repetitive patients. Another positive impact was discovered when patients would ultimately go by other means to an urgent care or emergency department and in turn notify the emergency provider that they were evaluated by EMS. At the request of the emergency department provider, we are then able to send them the patient response information from our interaction. This information provides assessments and other key factors that the attending provider may need to offer effective care. This can all happen in real time because the patient has already provided written authorization for the release of their medical record to the provider. An unexpected result that has also created a positive impact is the utilization of the hospital’s immense resources. When a patient has authorized us to send their medical records to their healthcare provider it creates a bond that allows us to share information for the benefit of the patient. This makes it possible for us to reach out to social workers or other healthcare resources such as patient advocates to help patients with things that we are not equipped or staffed to handle. A person will utilize the 911 system for an unmet need, even if not medical in nature. We now have an expanded use of resources to meet the needs of patients in our community. Improvements have been made to our quality assurance program for patients who requested service but refused transportation. With the addition of the follow-up calls by nurses, we were able to track and review patient outcomes when they refused transportation. Being able to ascertain a patient’s final diagnosis by another medical professional versus what was determined in the field has given us valuable information to use for training and education. Before the use of this new method the quality assurance process could only make a determination based on the narrative written by the crew. Now, we are able to have a full circle review of the care and outcome of the patient. As health care continues to evolve with trends towards CP and MIH and possible changes to Medicare reimbursement, reviews like this are becoming ever more important. Additional research is being proposed by a local hospital to do a retrospective analysis to determine the impact of the process on patient outcomes. The study is focused on patients who called 911 related to a fall and are over the age of 55. The purpose of the study is to determine if interventions performed by their provider reduced the likelihood of future falls or injuries related to falls. This is being done in conjunction with data from the hospital and any interactions a patient has had with the ambulance service.